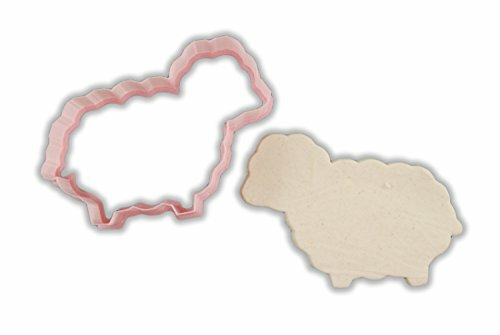 This Fluffy Sheep Animal Cookie Cutter turns your kitchen into a creative lab! Cut and decorate fun, clean shapes for your family and friends to enjoy! Baking can take time, a lot of time. But nothing takes longer than trying to look after the kids and clean up at the same time. Hit two birds with one stone and get them involved. With our safe and easy to use cookie cutters, the kids can help you make the cookies, biscuits, and fondant. Once the treats are in the oven or lunch box, it's time to clean up (the worst bit). Don't worry, another convenient life lessons presents itself- teaching the kids to clean up after themselves. Simply run some warm water and gently screen the cutters until clean. Easy. Baking is be fun, baking with the family is memorable, baking with our cutters is easy. We're bakers ourselves. All of Cookie Cutter Kingdom's best bakeware is designed for our kitchens and yours. We believe in better kitchen products because helping bakers succeed with feeding the family something tasty is our ultimate goal. If you are not 100% happy, return your cookie cutter and we will refund 100%, no questions asked. PERFECT SHAPES EVERY TIME: Bake the perfect cookie with ease, no-hassle clean cuts every time. Why settle for less? Works great with chilled cookie dough, fondant, and gumpaste. Fun shapes with a Fluffy Sheep Animal Cookie Cutter. EASY TO USE, EVEN FOR KIDS: Baking made easy. Safe, effective cutting, so easy to use you can even get the kids to help you in the kitchen. DEPENDABLE AND DURABLE: Strong sturdy and dependable plastic for clean cuts. Don't waste your time with cutters which will snap and bend after 5 cookies. Spend less, bake more. EASY TO CLEAN: Baking is fun, cleaning up is not. No more crusted on leftovers, just add warm water and a give it a little scrub. Don't let baking become a chore, just a quick wash, and bake some more. 100% MONEY BACK GUARANTEE: If it's not your favorite cookie cutter which you've ever owned, the easiest and most convenient, return it for a full refund. No questions asked, just a prompt and courteous refund. We stand behind the quality of our cookware. Customers love that and love our products even more. We know you will too! ADD TO CART NOW. If you have any questions about this product by CookieCutterKingdom, contact us by completing and submitting the form below. If you are looking for a specif part number, please include it with your message.